Hey! There’s a lovely article about Our Lady of Charity by my friend, Pat Gohn, from Among Women Podcast. We’re working on making her an honorary Cuban, but first she’ll have to show me her dance moves. She is a woman with maybe a million titles—some majestic, some courtly, some theological, some regional, and some lovingly familial. From Our Lady of Fatima, to Our Lady of Guadalupe, to Our Lady of Czestochowa, to Our Lady of Akita, to Our Lady of Perpetual Help, to Our Lady of Grace, to Our Lady Star of the Sea, to Mother of Mercy, to Seat of Wisdom, to Gate of Heaven, to Cause of our Joy . . . Depending on where in the world you live or visit, you probably know one that engenders devotion too. Every version of her name blesses both her and the people who prayerfully call upon her unceasing maternal intercession and protection. No worries, the Blessed Virgin Mary answers to them all! Today, the Roman Catholic Church honors Mary—who mothers us all—on her birthday, the Nativity of the Blessed Virgin Mary. Meanwhile, important anniversary celebrations in Florida, Cuba, and perhaps elsewhere, honor her today as the Patroness of Cuba, Our Lady of Charity. 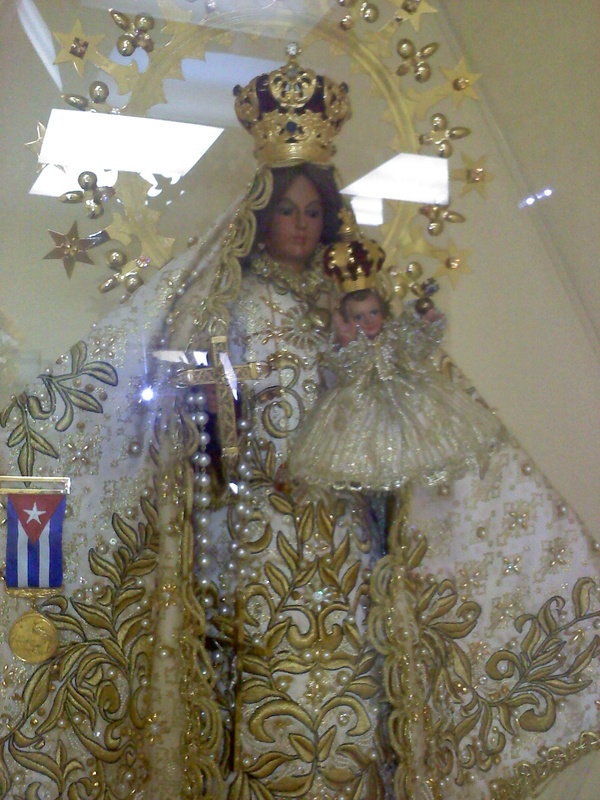 Her full title in Spanish is La Virgen de la Caridad del Cobre. I have long held a devotion to Mary. Thanks to my friendship with a few Cuban-American families, I have recently adopted this title, Our Lady of Charity, into my prayer…read the rest here. It’s a beautiful piece that recognizes not just a nation’s devotion, but the universality of Mary’s appeal. She is our mother, and draws us close to her heart, where she reveals to us her son, Jesus Christ. Oh, and get this! Somebody around here just might have done a little translation of it 🙂 You can read that here. Thank you, dear sister-in-Christ, for your lovely collaboration on this article in honor of Our Mother. Oh, great. Is dancing a requirement at the initiation ceremony?